Did you know that windows and domestic cats are the number one killers of songbirds? WildCare recommends keeping cats indoors for their safety and the safety of the birds. For more information on keeping your cat healthy and happy indoors, click here. Keep in mind that any animal caught by a cat needs immediate medical care— the Pasturella bacterium in a cat’s saliva can be a local irritant (or worse) when humans get scratched, but it can lead to a systemic infection that can quickly kill a songbird. Always bring cat-caught animals to the Wildlife Hospital, even if they don’t appear to be wounded.The other major cause of migratory songbird mortality is window strikes. The following steps can help reduce the number of birds killed by hitting windows, and a lot of lives could be saved if everyone implemented these strategies! These suggestions come from FLAP Canada (Fatal Light Awareness Program). Visit their website at flap.org for excellent information on prevention of window strikes for homeowners and major metropolitan cities alike! Position your bird feeders, birdbaths and other attractants half a meter (1.5 feet) or less from your windows. 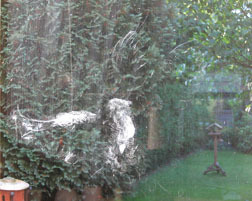 From this short distance, birds cannot build up enough momentum to injure themselves should they hit your window. This may seem counter-intuitive, but the closer the bird feeder to your window, the better for the birds and your viewing! 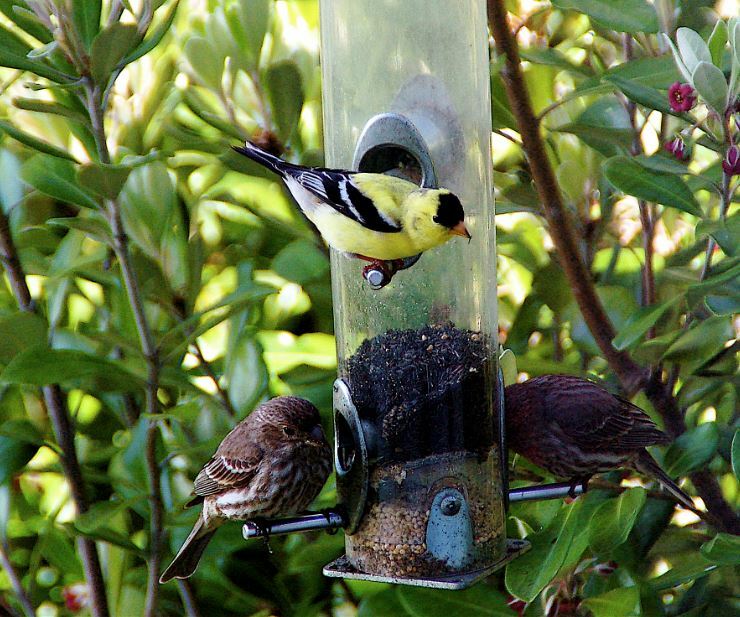 Placing feeders 30 or more feet away from windows may also help. If you can see your houseplants from the outside of your home, then so can the birds. Birds perceive your houseplants as a possible perch or refuge. Moving your houseplants back from your windows lessens this attraction. Close curtains and blinds to reduce the dangerous illusion of clear passage through windows, especially those that meet at corners, or where windows are situated in line with one another at the front and back of your home.Exterior window awnings can also help mute window reflection and help protect birds from the illusion of a clear passage. The key is to provide birds with the visual cues they need to alert them to the presence of glass. Visual markers on windows are the most effective collision reduction strategy when properly applied. Unfortunately, one or two stickers on a window aren’t effective. 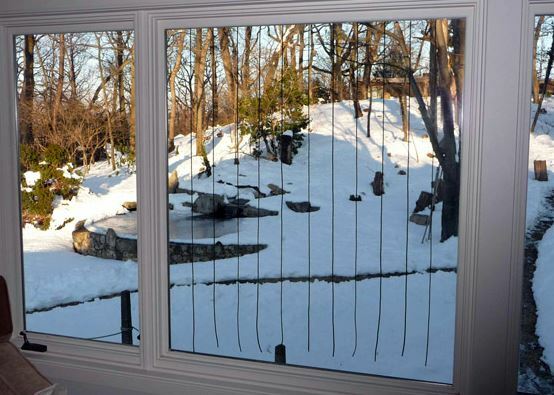 To properly alert birds, windows must be covered with a uniform pattern 4 inches apart for vertical alerts, and 5 inches apart for horizontal alerts. Always hang alerts on the exterior of the windows for best results. Please consider these steps to make your yard safer for songbirds! So many of the injuries WildCare’s songbird patients suffer are entirely preventable. With your help, more migratory songbirds will survive their arduous migration to sing another day.